The Adaptive Immune System Is Able To Mount A Massive Attack Against A Bacteria Or Virus And Remember It. Once A Disease Has Attacked and Has Been Beaten Back, We Are Immune For Life. Well, not always for life but a very long time to be sure. The innate immune system, powerful though it is, proved inadequate. Soon after the vertebrates appeared, we find animals with the adaptive immune system. The ‘reason’ for the development is this: The innate immune system can recognize quite a few bacterial and viral pathogens, but this recognition is more or less fixed, cast in the DNA of the innate system white cells. With their assorted special receptors, they can recognize a more or less fixed spectrum of bacteria. If bacteria would stay put – genetically speaking – this probably would have done the job. But, of course, they mutate all the time, continually picking up new DNA and discarding old. Same with viruses. As soon as a bacteria came up with some trickery that eluded the innate immune system, vulnerability to infection would dramatically increase. Of course, the innate immune system could, in principal, have evolved more and more receptors, but whereas bacterial DNA can evolve in a hurry, we eukaryotes are glacially slow. This was not a contest we were going to win. By contrast, the adaptive immune system can recognize every molecule in the universe, or so it is claimed. This includes bacteria, viruses, as well as other toxins, like oxidized LDL molecules. In a human body, the adaptive immune system can recognize around 10 million sorts of pathogen patterns. How it does this is another of those “gee whiz – how could this ever have evolved” moments. This one is complicated, but it’s not that hard, and there’s so much ‘gee-whiz’ stuff, it’s worth the read. Read slowly! 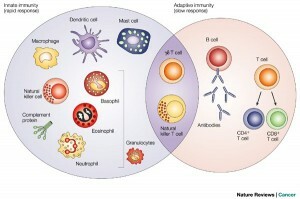 It’s worth knowing about the adaptive immune system. Recall that the innate system consists of: Engulfers, Poisoners, and ‘Natural Killers’. There is a prior post on that here if you want a refresher. Engulfers, also called phagocytes, are cell eaters. There are three subtypes here. A large one that can engulf a lot of bacteria (macrophage), a smaller, very mobile one (neutrophil), that tends to be a first responder, and finally, in mammals, a marker one (dendritic cell) that identifies the pathogen. The natural killers look for markings on a cell exterior and will destroy the cell if these are fishy. The B-Cell, T-Cell designation has to do with where the cells ‘mature’ and causes a lot of confusion. It is a lot clearer to look at what they do. B-cells are in charge of antiBodies. You have heard of antibodies. More in a minute. Helper T-cells are like managers or dispatchers. They don’t directly kill pathogens, but speed up and focus the response in a variety of ways. Killer T-cells do exactly what their name implies. All three of these cells have antibodies stuck on their surface, forming receptors, and they roam about the body looking for some invader that matches up (called an antigen). An antibody is a little “Y” shaped protein that matches patterns on a pathogen. There are a huge number of them, each with different patterns. They can be stuck on a B or T cell and used as a receptor, something that will detect and latch onto anything that matches its pre-programmed pattern. They can circulate freely and will attach to and neutralize a pathogen.. They detect bacteria and viruses, but also other things, toxic chemicals, damaged tissue and the like. Needless to say, there is a huge, almost infinite variety of possible bacterial patterns, so the human body generates a huge amount of different B and T cells, each one of them individually ‘programmed’ to specialize in one of around 10 million different antibodies. 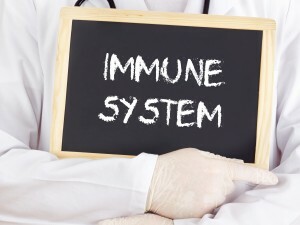 This is a whole lot more than the innate immune system could recognize. The T or B cell will use the antibody as its receptor and, in the case of B-cells, will generate more of these antibodies. Thus, in a sense, there are 10 million different types of B and T cells, each specializing in a certain pathogen. At any given time, there are around 10 billion such cells in circulation, so this means duplication and around a thousand cells will carry the same antibody for each of the 10 million types. A thousand isn’t a lot of defense against a rapidly dividing bacterial invasion, but wait till you see what happens next. As soon as one of the B-cells gets a match to an invading bacteria, it scurries to a lymph node and start replicating very rapidly. Each of the replicated cells is slightly different, so as to fine tune to an exact match to the invader. The various new B-cells that match the invader best then start spewing huge numbers of antibodies into the circulatory system. These are free antibodies and circulate about the body attaching to the invading bacteria, neutralizing it, and marking it for destruction by a passing macrophage. The B-cells aren’t quite done. Some of them differentiate into B-memory cells, which typically last a lifetime. Should the pathogen show up again, the memory cells are ready to lurch into the above cycle immediately. The B-cells are primarily looking for pathogens in the blood or otherwise outside the cells. If the cells themselves have been invaded, then the T-cells get into the act. The T-cells have the same huge variety of antibody receptors as the B-cells, but seem to be far less trigger-happy. In fact, unless some ‘proof’ is presented that a cell is infected, the T-cells do nothing. The helper T-cells will activate only if one of the engulfing type cells have gobbled something that matches its receptors. The killer T-cells look for the match within the cell, specifically the MHC protein. Once either of the T-cell type are activated, they go into a massive replication mode similar to the B-cells. After the replication, the helper T-cells secrete various interleukins, sounding the alarm, which draws other immune system resources to the vicinity: think science fiction like tractor beams. The killer T-cells kill the infected cell by poisoning it (actually, they inject an enzyme that causes the infected cell to commit cellular suicide, called apoptosis). And again like the B-cell, both T-cell types produce some memory versions that last a lifetime. This whole T-cell B–cell campaign tends to take 5-10 days to kick in. This is why colds and similar diseases tend to last about that long. 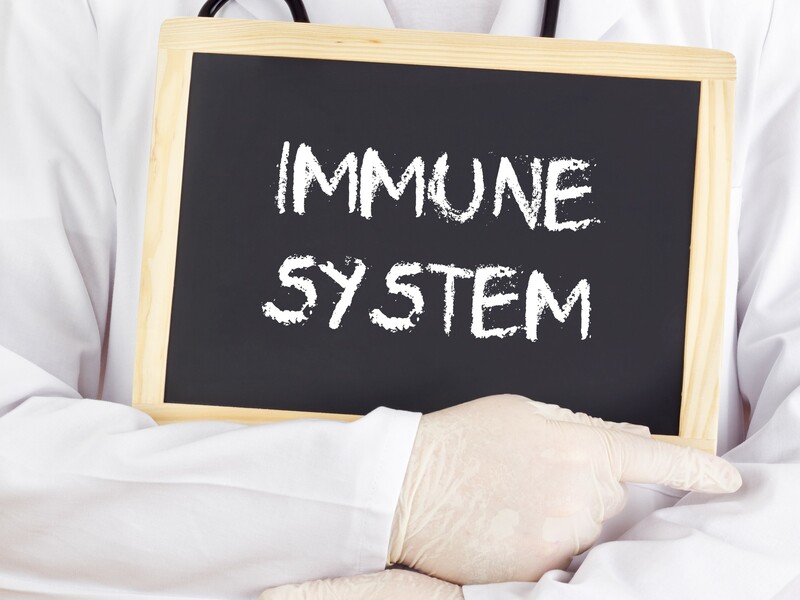 Until the T and B cells have finished things off, all the defense is in the hands of the innate immune system. The adaptive immune system evolved because the innate immune system couldn’t keep up with the bacterial and viral variety. It is claimed that the adaptive immune system can recognize anything in the universe, which is reassuring, if a bit presumptuous. Blackholes anyone? In any case, all this elaborate pathogen matching, antibody generation, and life-time memory, present their own problems, part scientific and part philosophical. Where did such an elaborate and thorough system come from? And where are the intermediate creatures who have only part of it? Like so much else in life: unknown, and perhaps unknowable. PS As many of you know many of the diseases from which mankind suffers are a result of the dys-regulation of this system; autoimmune diseases, like Lupus and Celiac disease come to mind.